Sometimes, you have accidentally deleted files on a computer and you want to recover them. PC Inspector File Recovery provides assistance in this kind of cases. It is designed by CONVAR. 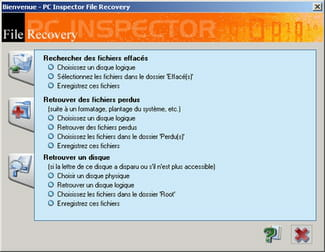 PC Inspector File Recovery can recover deleted files even on damaged partitions or disks with FAT file system. The recovery is done automatically with all the original metadata. All users need is to enter the name or any information that may help identify the file. It is optimized to recover files of the following formats: ARJ, AVI, BMP, CDR, DOC, DXF, DBF, XLS, EXE, GIF, HLF, HTML, HTM, JPG, LZH, MID, MOV, MP3 , PDF, PNG, RTF, TAR, TIF, WAV, ZIP. We tried to recover other formats, but the result is not guaranteed. It is important to note that PC Inspector File Recovery is powerless against hardware failure. It is impossible to retrieve data that is no longer recognized by BIOS or on a hard disk that emits strange noises. Very effective to recover some deleted files. PC Inspector File Recovery offers a well-designed interface. It can be used free of charge and for a long period. Latest update on August 31, 2017 at 06:15 AM.